Juntarra bids farewell to her son, Jagwar, and leaves to complete the Path of the Four Winds with Kid Terra in tow. 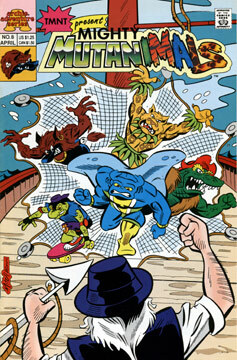 The Mutanimals spend time enjoying the tropical island lifestyle when Man Ray decides to go for a swim and discovers a whale entangled in a fishing net. Ray screams for the others to come and help him save her, but unfortunately the creature dies. Man Ray vows vengeance against those that caused her death and storms off into the jungle, where he rips a tree out of the ground in angry frustration. The rest of the gang arrives while Ray cools down and explains that the whale was a minke, a species that is still hunted. Man Ray declares that he’s going to put a stop to it and the others agree to help him.